Hey, That’s My Fish! Is an exciting, award-winning game of tactical fish hunting. Players navigate hungry penguins on a busy Antarctic ice floe. The object of the game is to catch more fishy meals than opposing rival penguins. 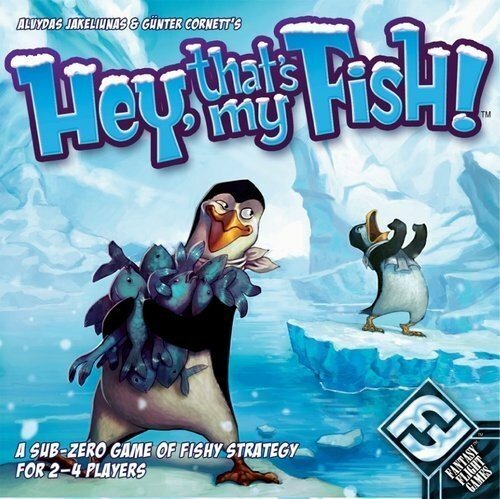 The original Hey, That’s My Fish! Was published in 2003 by Fantasy Flight Games. Since that time it has become extremely popular as an engaging and strategic board game for families. It has accrued prestigious awards and continued to improve in physical quality and visual appeal. The game is rated for ages 8 and above but we think kids as young as 5 could play. It’s relatively quick and action-packed. A round takes about 20 minutes. The game components are high quality and durable. It includes counting, easy math, critical thinking, decision making, and strategy. The game is easy and exciting to play for both kids and adults. The game includes 60 hexagonal tiles with 2 or 3 fish printed on each and 16 penguins in 4 different colors and stances. Set up involves laying the 60 ice floe tiles in rows creating “the board”. Then each player takes a turn placing their penguins on the tiles. After everyone’s penguins are placed, players take turns moving 1 penguin at a time in a straight line through the hex shaped ice floe tiles. Tiles are removed in each penguin’s wake leaving gaps as each player advances. Players can move their penguins as far as they want until they run into an opposing penguin or a gap in the ice floe. Then they are forced to stop. The game is over when no one is able to move legally. The player that’s collected the most fish wins! Because the board is created by laying individual tiles, the setup can be different all the time. We’ve found different setup configurations have a big impact on how quickly the ice floe breaks up into different playing areas. Hey, That’s My Fish! is game that is fun for everyone; young, old, and even serious gamers. The simplicity of the rules make it easy for anyone to play and the gameplay is cutthroat enough to satisfy the majority of strategy loving players. Quality durable game pieces and fun artwork. Really easy to teach and learn. Different board configurations make the game a bit different every time. Reasonably quick and seriously exciting to play. Setup takes more time than most board games with 60 individual tiles and numerous ways to lay them out. 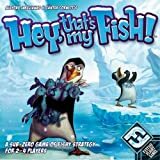 Hey, That’s My Fish is a fun and exciting tactical game made of high-quality durable game pieces. It earns a high replay value because of it’s engaging strategic type play. A wide range of people will love to play this game.